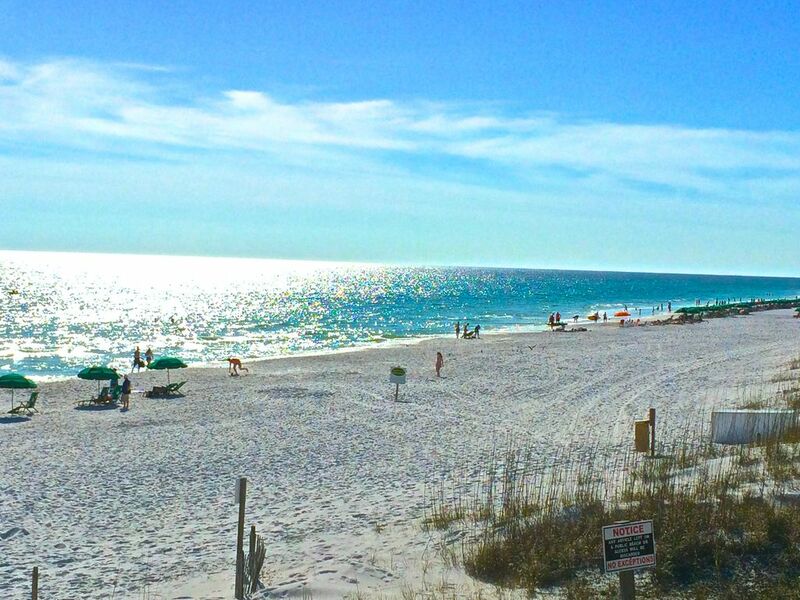 Want to Vacation in Destin Florida? Have we got the Condo for you, this luxury two bedroom, two bath Destin, Florida vacation rental condo comes with gated entrance, two car garage with beach equipment for your use. A balcony with a view of the Gulf of Mexico. The Destin unit is large and spacious with ten-foot ceilings. Totally furnished with bright color scheme of yellow, blue and white. This Destin vacation rental condo is approximately 1500 sq ft, with beamed ceilings, however feels much larger. Please visit our website by clicking on the link below for more info and booking. Step into the master bedroom of this Destin apartment and you will be greeted by ocean blue and sunny yellow linens on a comfy king size bed. The second bedroom, also done is tropical, ocean hues has a queen size bed. Additional sleeping arrangements can be found in the living room as it contains a queen size sleeper sofa. The kitchen in this Destin condo is fully equipped with all the comforts of home, has bar type seating and is open to the living room, perfect for entertaining. The living room is large and airy with and decorated beautifully in floral and white. The carpet was newly installed in October of 2004. The living room has glass sliding doors which provide a perfect view of the pristine beaches of Destin, its emerald waters of the Gulf of Mexico and sugar white sand. Step out onto the balcony for private dining, read the paper, etc..
Additional amenities to help enhance your vacation stay in Florida include three televisions with cable and DVD, and a pool with tropical landscaping. Destin Florida is a hub of activity, and this condo is within moments of it all! Be sure to check out the Destin area restaurants for casual and fine culinary experiences. Shop till you drop either at the mall or in the boutiques of the downtown Destin area. Take a stroll to the harbor where you can find dinner cruises which will give you a different perspective of Destin. Golf courses as well as water sport activities such as sailing, parasailing, jet and water skiing also await you and are at your services at out lovely shoreline. We promise your vacation in Destin Florida will be a vacation of a lifetime! DVD Player, Pool Garage, Utensils, Stove - Electric Refrigerator, Microwave, Ice Maker, Full Kitchen, Dishwasher, Coffee Maker, TV/DVD, Linens provided, WIFI internet access, CD Player Cable/Satellite TV, Air Conditioning, Laundry Room. Great place to stay, very comfy!!! The condo was perfect and as always the beach was amazing!! Very spacious with a great location. We will definitely be back!!! This condo is so much bigger than we expected. It's very clean and well kept. It is just across the parking lot from the public beach. There's a pool right outside as well. The only complaint I had were the men doing yard work very loudly before 730 am on 2 different mornings.